British progressive heavy rock bands like Deep Purple, Black Sabbath, Uriah Heep and Led Zeppelin inspired many young bands in Germany. The Germans usually preferred to use English lyrics, and several bands, like Blackwater Park, 2066 & Then and Epitaph, had British vocalists! 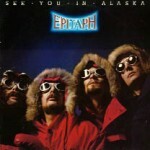 Epitaph were founded in Dortmund in 1969, consisting of Cliff Jackson (vocals, guitar), Bernd Kolbe (bass, mellotron, vocals) and Jim McGillivray (drums). The first sessions for their debut album, released 1971 on Polydor, were recorded in an Essex studio in England. For unknown reasons, it was however finished in Windrose Studios, Hamburg, where a fourth member was added to the group: Klaus Walz (guitar, vocals). The five resulting tracks sounded similar to the groups mentioned above, and particularly the earliest incarnation of Uriah Heep. Epitaph’s Cliff Jackson didn’t attempt to copy Byron’s operatic vocal style, though. There were both fast rock’n’roll numbers and slow ballads with mellotron textures, usually in the ‘heavy progressive standard song length’ – from 5 to 7 minutes. In 1972, Epitaph recorded their second album, “Stop, Look And Listen” in Audio Tonstudio, Berlin. This album also contained five tracks, stylistically similar to their first offering. Both albums are recommended for fans of the heavy progressive genre. In early 1973, Epitaph released two non-LP singles on the Polydor subsidiary Zebra: “Autumn ’71” coupled with “Are You Ready” (2047 003) and “We Love You Alice” coupled with “Paradise For Sale” (2047 005). After this promising start, it seems as if the band was promised a bright future by the newly founded American record company Billingsgate, that they eventually signed to. The band invested much time and money into their third album, “Outside The Law” (1974), and aimed at an international break-through. On this album, McGillivray was replaced with Achim Wielert (drums, percussion). The music sounded more polished this time, as the band abandoned progressive elements for a more straight forward heavy rock style. Sadly all their dreams of success were brutally shattered, as Billingsgate soon went bankrupt and all their money was lost. Epitaph had laid out on an extensive (and expensive) USA promotional tour (with ex-Karthago member Norbert Lehmann on drums) in October 1974 – on their return they had to sell their gear to survive! Their new album was part of the bankrupt estate of Billingsgate, and Epitaph were forced to disband in 1975. The band secretly reformed later the same year, but didn’t record any further albums until 1979. Epitaph went through major changes during 1977, and only Cliff Jackson remained from the original group. His new crew consisted of Heinz Glass (guitar), Harvey Janssen (bass), Michael Karch (keyboards) and Fritz Randow (drums). They backed Omega on a Europe tour in the Autumn of 1977. The band finally signed a new recording deal with Brain, resulting in the mediocre “Return To Reality” (1979). The band now performed a melodic boogie hard rock – of no particular distinction or interest. “See You In Alaska” (1980) was a similar effort. Karch quit after this, leaving the four other to record a live album. In 1981 the new Epitaph disbanded. Surprisingly enough, the original Epitaph (Jackson, Walz, Kolbe, and Lehmann) soon attempted a short re-union. “Danger Man” (1982) was perhaps better than the Brain albums, but not able to recapture the spirit of the past times.